The Women@Crosspointe ministry's desire is to connect with the women of Crosspointe and the surrounding communities to help them walk with Jesus in a way that will transform their lives and the lives of those they touch. Women@Crosspointe offers Women's studies, a mentor/mentee program for women and teens and a calendar of social events and activities. Women's studies meet on Monday evenings beginning at 6:30 p.m. and on Wednesday mornings at 9 a.m. Childcare is available for all studies. Women@Crosspointe offers a robust selection of video based studies that encourage women to engage the scriptures throughout the week through Precept style study or workbook led assignments. Studies are offered quarterly with registration and material purchase available online and in class. All of the Women@Crosspointe electives are open to our C3 ladies as well as the women of our community. Click the button below to view the current offerings, sign up and/or purchase study materials. 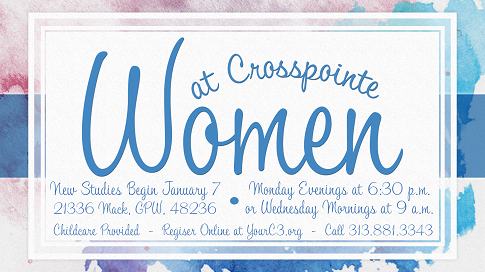 The Women@Crosspointe events calendar includes classes, prayer opportunities, and community events. Check back often for updates. Click HERE to sign up for a Women's Study.